Hi Brandi, guess it's time to redress my bird. You're the creative genuis, so whatever inspires you. Oh, I just LOVE what you do!!! Sparkles, water, glitter...I love it all! I give you full creative license! So, do you see something you like? Oh I LOVE THEM ALL!!!!!!!!!!!! I will use them ALL!!!!!!! I saved 'em! I JUST LOVE THEM!!! very very nice Brandi...You really add so much to this forum! coming into this thread makes monkeys happy! Are you interested in the girl I made for you a while back? The one below? I could make that bigger. Or tell me more about what you'd like. Not sure what colours you like. Been making avatars for the past 11 hours! I'll work on yours tomorrow. In the meantime, no hints for me, like what colours you like or any visions you might have? Let me know your feelings when you see these. I kept the animation slight so as not to make you dizzy, but I wanted to give you some glitz! First one has no flowers or lei, second one has flowers behind ear, third one has flowers and a lei. Brandi~Gosh, it is absolutely perfect! Thank you so much! You are so creative. Just so you know, you never have to rush to get me an outfit. I can wait as I am never in a hurry to do much of anything. I'm glad you got my message, I thought I saw you but you must have been here. Brandi, I loveeeeeeeeee the first one. You got my style. When I have time, I'll change my little bird. Thank you soooooooo much. You're the greatest!!!!! I have always enjoyed your lil ice cream cone guy! I am very pleased you like the vacation in Hawaii. I'm having a cow. 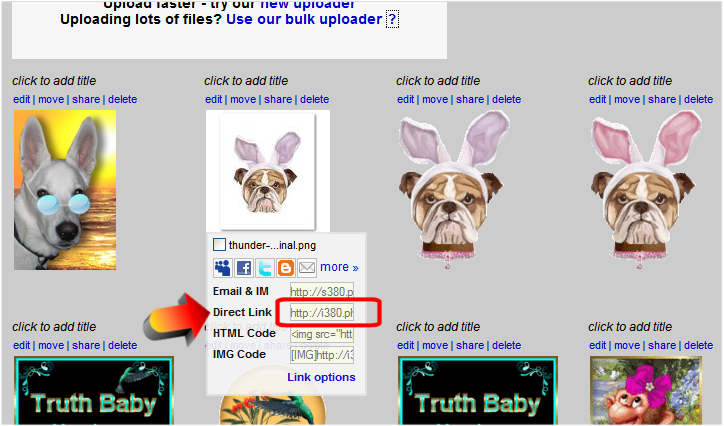 I've put my plain old bulldog in my photobucket account. I'm trying to use it, (cause I'm not going to go incognito anywhere) on something else and I can't figure it out. wah. You always do all the work for me. Copy and pasting the link. I am an idiot without Brandi. CAN WE GET A STANDING OVATION FOR MISS BRANDI???????????? I do hope you read here, no rose. I noticed you are using a new image of Zoe, so I made you a summertime avatar if you are interested! I hope you and Zoe have a great summer! If I understand your question, you are trying to use an image on another website. Everyone's photobucket account pages look a little different, but here is a screen print of part of mine to show you what to use to directly link to one of your images. I hope this answers your question. If not, I'll be looking for your response and will reply as soon as I see it. OHHHHHHHHHH! I SEE~~~~!!!!!!!! I was trying to use all the other links. BWHAHAHAHAHAHAHA You amazin' girl, simply amazin'!!!! If you can tell me what size you want it, I can resize it for you. If you are not sure what size is allowed where you want to use it, you can email me and I can go there and see for you. Then I'll resize it for you to use wherever it is you are wanting to use it. I recently learned the techniques of animating water and of course, your avatar came to mind. Thought you might want to get out of your Fourth of July garb. First, I took your original avatar (with the hat added) and then animated the water. Then I found a really beautiful sea picture and animated that water and put you into it! The second one has the addition of a bird. Can you change me out of the 4th of July to a summertime theme? Anything you come up with will be fine. No hurry!